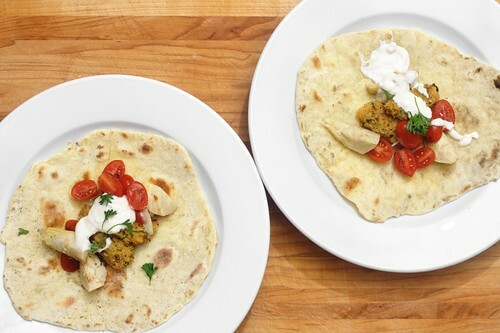 black cumin chickpea fitters with fresh flatbreads and garlic yogurt sauce, originally uploaded by aarn! +7th October, 2010+. ground up a few cloves of olive oil poached garlic with a handful of parsley, a shallot, salt, pepper, a pinch of cayenne, a little whole grain mustard, fresh ground coriander and black cumin, a pinch of cinnamon, and 2c. of chickpeas. removed the mixture from the food processor (prior to it becoming a paste, left it a little chunky) and mixed in a little bit of flour until the consistency felt right (about 1t.). formed the chic pea mixture into quenelles and set aside until ready to be fried. set the deep fryer to 375-degrees and dropped in the falafel quenelles until brown (ideally, yes, for some reason these fell apart a bit when fried...maybe the quenelle is too gentle of a technique to use for this coarse ground mixture). mixed one mashed clove of olive oil poached garlic, a splash of lemon juice and some salt into a cup or so of yogurt (from narragansett creamery). lightly incorporated a pinch of salt, a splash of olive oil, a little wheat gluten, and a little bit of active dry yeast into a cup of all-purpose flour. mixed some milk into these dry-ish ingredients until at a wet-ish bread-ish dough consistency. rolled out into a handful of thin discs (about 8-in in diameter), on a flour-dusted work surface, using a french rolling pin. transferred the doughy discs to a hot baking stone in a 425-degree oven for about two minutes a side. served the fritters over a flatbread with some quartered artichoke hearts and halved plum tomatoes (tossed in a little olive oil and lemon juice), a dollop of the garlic yogurt sauce and a sprig of fresh parsley. This recipe is going into the 'things to cook for a hypothetical vegetarian girlfriend' category. Good stuff!